Eco-friendly Camping: How Green Can you Go? You have choices when you plan your vacations. The world is a big place and there are a million roads, but what about getting off the roads, at least those well travelled? Connecting with nature has myriad benefits for your physical, emotional, and mental health and using your well-earned vacation time to strengthen that connection is an invaluable investment in yourself and the environment. Let’s talk about camping: whether you are pitching a tent, wheeling a motorhome, or renting a cabin in the woods, you’ve already made a commitment to the environment by heading into the trees instead of into the city. But you can always do more. With a little forethought and planning, there are many things you can do going into the woods and beyond to make the world a little greener while you soak up the nature-inspired happiness. 1. Tent when you can. Tents take fewer resources to produce and are easier to recycle than RVs, so if you can manage, take the simpler route. That said, if the RV is the only thing that keeps you from 100 percent city-bound vacations, keep the rig and keep it small, but maybe explore the possibility of the occasional tenting trip. There is nothing like it! 2. Stay on the beaten path—sort of. 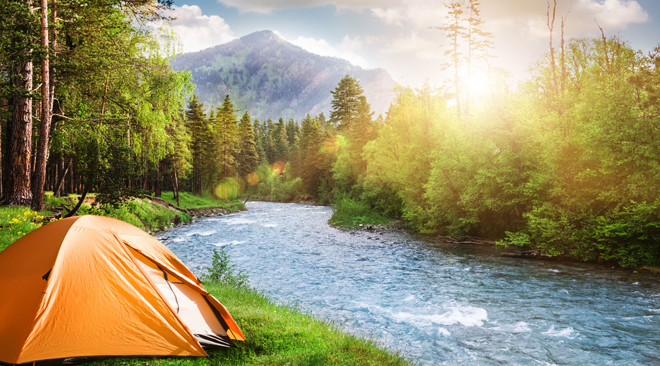 Exploring the wilderness is, of course, the point of camping but be sure to set up camp in designated or previously used spots. Plants are your friends, so don’t squish them! 3. Bring reusable and chemical-free supplies. Yes, paper plates and plastic cups are easy to toss, but that is where convenience ends considering these items take 30-750 years to break down in the landfill. And DEET bug spray works like a hot-damn, at the expense of your respiratory health and the environment. Collapsible, reusable dishes; chemical-free soaps and sprays; and, items made of recyclable materials are easy changes to make with a huge resulting impact. 4. Practice fire safety. Always use designated fire rings, or learn from an accredited professional how to make a small, safe, backwoods fire (Pro tip: YouTube is not an accredited professional). Never bring in your own firewood, because with it can travel bugs, seeds, or micro-organisms that can harm species native to where you are camping. Check out amazing ways to cook on your fire in foil or a Dutch oven—those pressurized propane cylinders are tricky to recycle. And for serious, put it out each night … with water! 5. Pack it in; pack it out. The trick to minimizing waste on a camping trip is staying organized. Pack your own garbage, recycling, and compost bags, sort your waste as you create it, and pack out what you bring in. It is much easier to commit to this if the waste is already organized when you get home. There are also big-picture steps you can take to greening your camping trips—steps that will continue to help long after you’ve hung up the tent pegs. 1. Use pedal power. Bring a bike camping and keep your vehicles parked. Exercise: check. Mental well-being: check. Environmental protection: check, check. 2. Limit water use. Fewer showers means protecting and preserving our waterways. Swim to remove dirt and odour and when you do shower camping, consider going two (or more if you have children) at a time. 3. Buy and eat local. Bring your staples, but consider seeking out farmers’ markets and local food producers, especially in remote and rural communities. You are greening your food choices while supporting local economies. 4. Shop smart for gear. If you aren’t a big camper, there is no need to dump a pile of money on spiffy new gear. Borrow, shop used, and trade with friends. If you are a keener and need your own stuff, take your time and shop for recyclable or made with recycled materials items and support wilderness co-ops with solid sustainability policies such as Mountain Equipment Co-op. 5. Protect the land. I know I don’t have to say it, but I am going to say it anyway. Nature is not ours to take; it is borrowed from our future generations. Be kind, tread light, and leave the Earth in better shape then when you arrived. Do you really need those stick and rock souvenirs? I think not. Take only memories and a firm commitment to protect our planet every day of every year. See you in the trees!